Update: First, a welcome to anyone who has dropped by my blog via the Zon troll. I am hopeful that most of you are here to learn the truth, which is very simple: the allegations against me and many other authors are false. I can't speak for everyone, but I know I have not paid thousands of dollars for fake 5-star reviews. I have better things to do with my money. Amazon and Fiverr have been notified of both sites that are blatantly using their names in order to appear valid. In an email I received from Amazon when I reported these slanderous blogs, they told me they were investigating the Zon and Five Report blogs. Fiverr (which is NOT the Five Report) has already issued an email stating that those blogs, written by a cowardly troll whom we believe is another author who was, himself, proven guilty of faking reviews, are bogus. For those of you who are decent enough to not judge us based on this person's malicious lies (and no proof), we thank you. Kirkus’ Indie program was started in 2005 when the editors wanted to expand their coverage to include the fastest growing segment in the book industry — self-publishing. To meet scale, selection and financing challenges, Kirkus created a review service for self-publishers called Kirkus Discoveries, now Kirkus Indie...Authors could finance the review themselves and guarantee selection for review, but the books would be held to the same high standard as books published by the major houses. The program gave self-publishers the chance to earn honest critical acclaim from one of the most prestigious brands in publishing. NetGalley is another popular company that charges publishers or authors a fee to have their books set up on their site and sent out for reviews. Even the BIG publishing companies are using them. I know this because I've received an invite to review a couple of my favorite authors' books. NetGalley is well known and well accepted in our industry. Readers love it because they can get involved and read a book before everyone else--and review it. Honest reviews only! Ten years ago, when my first book was published, it was completely acceptable to pay a reading or shipping fee to a review company--even Amazon accepted paid reviews back then--as long as the reviewer didn't guarantee a gushing, fake 5-star review. Why would any author even want that?? A fake review like that means absolutely nothing! At least, to me it means nothing. I personally only want honest reviews. Have I ever paid a review company? Yes, years ago. When it was completely ACCEPTABLE, but only for unbiased reviews from a known review site at the time. There was no guarantee they'd give me ANY stars or say anything nice about my books. They could've trashed them entirely. I did this maybe 6 times. But I ceased this practice years ago, even before Amazon changed their policies on reviews, because I preferred spending my marketing budget elsewhere. Yesterday a writer friend pointed out a blog that accused one indie author of paying for fake book awards. In another post, this blogger goes on to list authors who have allegedly paid for 500+ fake 5-star reviews. Of course the blogger has no proof of his accusations. As I read through the list, I recognized many names. Some, like JA Konrath, have long ago explained their views on reviews. Then I saw a name that made my heart stop. Mine. WTF???? This person is claiming I paid for over 500 fake 5-star reviews? This is a complete lie! I don't know where he's gotten his information from, but it certainly isn't the truth. Perhaps he's hearing voices in his head. I suspect he saw the 5-star reviews for CHILDREN OF THE FOG that came in mainly in 2012 and decided that the only way I could've gotten them was if I paid for them. Really?? He's ASSuming. In fact, I sold over 50,000 copies of COF from March 2012 on as a result of Amazon introducing the KDP Select program, which I was very successful with. And I gave away even more copies for free. That's where most of those reviews came from. Here's the real truth: There are cowards out there whose sole purpose is to defame others. They do this because they are jealous. Often they are writers who haven't seen any success so they go after those who have. Perhaps they're just bored with their lives. So they intentionally set out to cause harm to others. These "trolls," as we refer to them in the book biz, can be identified by certain behaviors. They leave 1-2 star scathing reviews on successful books (usually not verified purchases), they bash the authors instead of reviewing the content (because they haven't read the book), and if you go into their profiles, you'll see a pattern of low stars, sometimes with the odd 4-5 star review thrown in. Sometimes one of those 5 star reviews is their own book. Sadly, I discover too many times that a 1-star review is from a competing author (sometimes they've even left a link to their own competing book, saying it's so much better), and when I report this to Amazon, they have removed the review. 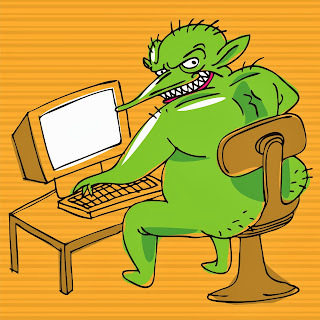 There are even stalker trolls who aren't satisfied with just bashing your book in a review; they go into other reviews and leave nasty comments. The whole concept of book reviews is so warped now that it has become a war zone for everyone involved. And now we have the author bashers who have taken to blogging and slandering others publicly. For what purpose? To make them feel better about themselves, I guess. I'd also like to point out that ANYONE could pay for a review for someone's book if they really wanted to. There's no law against it. So what's stopping this blogger (who is nameless because he/she is cowardly hiding behind an anonymous blog filled with fake information) from setting up fake reviews of his own and then claiming an author did it? Let's question THIS person's integrity for a second. He/she makes claims but doesn't show any proof. And there is no name or contact info for this person on their blog. Hmmmm...that sounds very suspicious to me. This leads me to an important message for us all: Don't believe everything you read. People who spend their lives trying to ruin others are to be pitied. They don't know how to achieve success or recognition any other way. There is something seriously wrong with someone who intentionally trolls successful books so they can leave one-star reviews--with one intention: to damage that author's sales. And there's something sickening about a person who spreads lies and calls them fact. Jealousy and envy are always a problem when others are successful. There are still many companies out there who offer unbiased reviews and charge a reading or mailing fee so they can ship the book to their reviewer. While Amazon won't accept these reviews (and I respect that), other places will. This is an industry practice that many authors--both traditionally published and self-published--have used for decades. Will they continue? I don't know. I don't plan to use them, but that's just me. I walked away from my former traditional publisher (who took my book out of print and gave me my rights back) because he wanted us all to write fake 5-star reviews and other ethical issues I didn't agree with. I have integrity, and I do my best to adapt to the changing trends. Disclaimer: I have never paid for 500+ fake 5-star reviews. My reviews came from getting over 68,000 copies of my works into the hands of readers whether through sales or free giveaways. I read that article and all I recall is his comments on the awards someone was claiming to have won. He presented data about that. And Konrath does admit to buying but he also freely states that that is how he got his foot in the door. In both cases, the person was generously underwritten, the part I am obviously jealous of since I work on a shoestring. I’m sorry you’ve suffered this blow. I can only imagine how hurtful it must feel. I'm pleased to be able to confirm OUT LOUD that in all my dealings with you as my publisher, your stand on reviews has been based on honesty. I didn't read the link the troll left--now deleted--but he or she also accused Hugh Howey and Blake Crouch in the comment, and tried to stir the pot. I politely called BS, and then we all ignored the troll and went on with a very productive discussion. Don't let the haters get under your skin, Cheryl. Like Hugh, Blake, and Joe, you're a victim of your own success here. The best policy is to smile and ignore the trolls. The rest of us will. Virginia, there was no valid data, no proof given by the blogger about the other author he was claiming paid for awards. Nothing at all. No proof. And in the other post about author who he alleges bought 500+ fake 5-star reviews there was absolutely no proof either. This guy is someone who has a personal beef with at least one of the authors he defames. Cynthia, I sincerely thank you for your support. I know you've probably heard me say it countless times, there's just no value in paying for fake 5-star reviews or swapping them. Reviews will come in eventually if you keep writing good books. Karma is a b*tch, and the owner of that website is about to find that out. A concerned citizen contacted Fiverr's legal department and received the following verification of the false accusations. Please share this publicly and stop the hatred! I've removed her name to protect her from being attacked as we were. Thank you for reporting this. This blog is a complete fake, including the "employee" who was never employed at Fiverr and the information provided in the blog, thus there is no breach of privacy since it is not real information...the users mentioned on the blog are not known to us. We do appreciate the fact that you took the time to alert us to this slanderous content. Trolling is usually done by malicious individuals. But not always. It can also be part of a smear campaign, orchestrated by unscrupulous companies against competitors. What large companies might feel threatened by the folks on that list? Thank you for your comments. I would consider a company searing authors to be malicious as well. In this case I can't think of one company that would honestly consider me any kind of threat. Or Joe. Or Hugh or Blake. But I guess anything is possible. Sad though, isn't it? Low-life people like this need to be castrated and hung out to dry. I will never understand why bash someone who is successful. Maybe if these idiots took the time to see what you and the others are doing successfully they would learn how to market there own book. but then they probably forgot that they needed an editor or they just cannot write. You and all the author's have my full support. I do not believe anything on that fake website. Many thanks for your support, KyBunnies. I truly appreciate it.